I am so obsessed with this body brush, it might just become my go-to gift for any gal who shaves or waxes religiously. After I shower and dry off, I'll gently rub this body brush around in circles on areas where I shave, wax or need a bit of extra circulation (ahem, jiggly thighs). It warms up the skin, exfoliates like crazy, and feels so rejuvenating. I originally bought the body brush, which I only use for my legs because the bristles are really long and scratchy. The bikini brush is completely different, so I can use it on my under arms, back, chest, etc. to give a good shed of dry skin. Purchase at Furr Wax Studio 545 St Clair Ave W, Toronto, ON for $18. I got this hair brush from my boyfriend's mom as a little impromptu gift, and boy am I thankful for the small but mighty gesture. As I've been growing out my hair, this is the only brush I use to detangle my freshly washed hair. I also love using the brush to diffuse my dry shampoo through second and third day hair. It's incredible, you have to try one. Sold at most salons, on Amazon and at beauty supply stores. 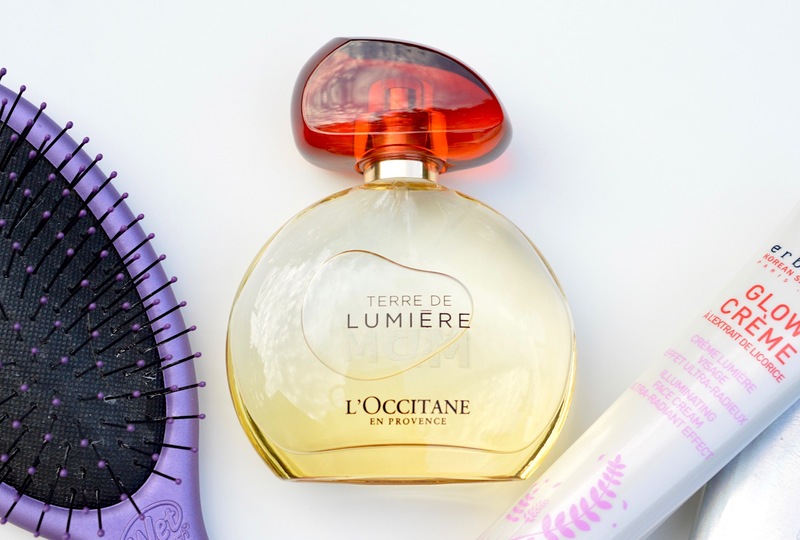 Everyone needs a light summer fragrance, and L'Occitane's most recent collection is spectacular. Discover Terre de Lumière, inspired by the Golden Hour, a unique moment in time right before the sun sets when the light embraces the sky. Our NEW fragrance captures this special fleeting moment to make it last forever. With zesty and aromatic top notes, this unique fragrance unexpectedly develops into delicate aromas of lavender, honey and almond from the South of France. It is described as aromatic, sweet, almondy, floral, honey and musky on Fragrantica. I find that the warmth of this fragrance is very comforting, and totally embodies the beauty of the golden hour. You can also try the body wash and shower gel online or in-store. Lucky me, I was sent a bottle with my initials engraved on the back! Clarins has re-released their Body Lift Cellulite Control system, now called Body Fit! This regime promotes a healthy lifestyle paired with contouring body products to help tone up your legs - both during the summer and beyond. I love how enjoyable the Clarins experience is when using this lotion. The ingredients include quince leaf extract, caffeine, aquatic mint (it's super minty! don't put it on your sensitive bits), celosia, baccharis, scabious, horse chestnut, sunflower and hazelnut oil. I usually apply it with my hands, but you can also put the "Multi-Mass" tool to work to help smooth away cellulite and facilitate the penetration of the Clarins product. 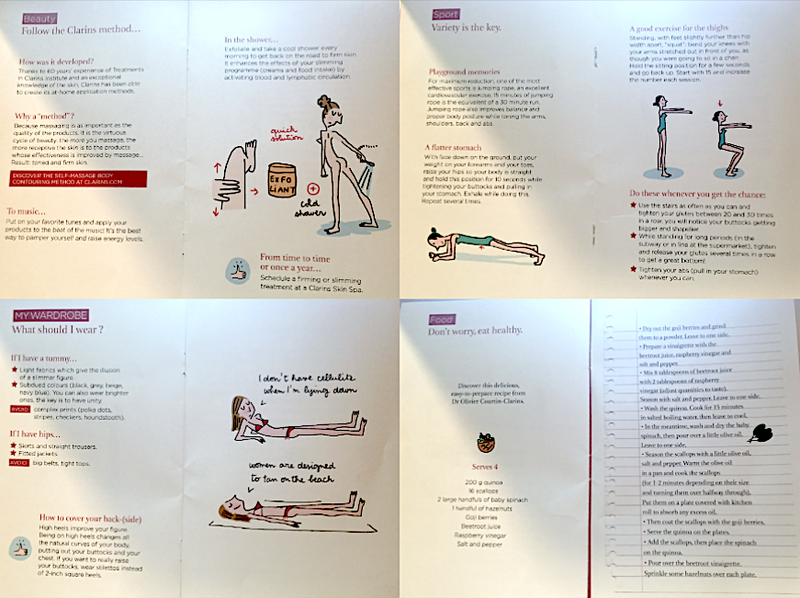 This Body Fit duo came with a little book outlining some classic Clarins healthy lifestyle tips complete with the cutest French drawings. I love all of it, you need to check out their original book here called "Doctor I Want to be The fairest of them All!" - it also comes in French. The Multi-Mass tool is very interesting, and you can see how it should be used above. I love the "Polish" side of it, which I've used a lot on my arms and legs. This is a really nice alternative to my Merben brush above, especially since the Multi-Mass is made of hygienic plastic that can be reused indefinitely. You can try out the anti-cellulite treatment products by purchasing online here or at a Clarins counter. Ah, my beloved glowtion. This day cream is so subtly illuminating when you apply a thin layer all of your skin, and literally makes you look like a perfect pearl. 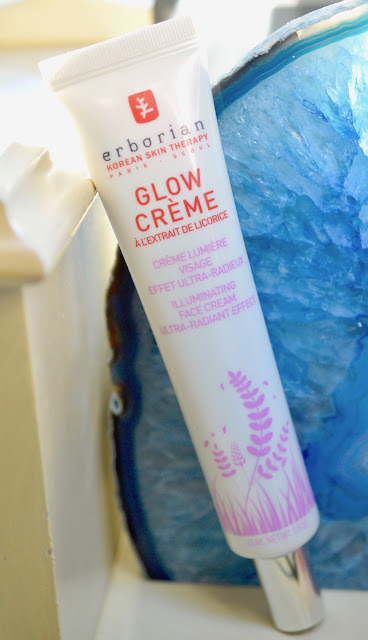 It's a great makeup base and comes in a tube which travels very well. Sometimes I'll mix it with a thicker, flat foundation to give me a bit of lustre when my skin is looking tired. It's the perfect product for your beauty arsenal, especially since the licorice extract will help to brighten your natural skin overtime. Purchase online here or at Sephora.